This weekend, we'll be discussing Bridge on the River Kwai. It is available in full on youtube. If anyone is aware of other free, legal formats feel free to post those as well. Let the fun begin! This should be interesting! I love Alec Guinness and Lawrence of Arabia (same director). I do have a problem with earworms, however, and that whistling might drive me mad! Wow. What a film - really glad I made time to watch this one. The cinematography was beautiful, the dialogue was enjoyable on several fronts, and the actors were superb. So we have one character, Nicholson, so dedicated to upholding the letter of the law he loses his purpose (his statement at the beginning of the film that they were ordered to surrender seems to imply he knew of a greater goal for him being there) and nearly ruins the mission. There's a lovely shot of Sir Alec looking out across the river from the bridge and wondering if his life meant anything. Shears is dedicated to the opposite ideal, that "the only important thing is how to live like a human being" but he ends dedicated to the mission. Saito begins strong willed but slowly breaks. I was surprised how bad I felt for him (it really was a difficult position to be in) but he was so awful and manipulative in the beginning I cheered every time he lost a battle of wills to Nicholson. This gem of an exchange. "My officers will not do manual labor." "We shall see." And this one. "If you were in my position what would you do?" "I suppose if I were you I'd have to kill myself. Cheers." Loved it when Nicholson rubbed Saito's failure in his face talking about how he didn't know if the bridge could be completed in time, but they'd try and the unfortunate matter was due to no fault of his own. There seemed to be an overall theme of resilience, optimism, and defiance in the face of adversity, and that was lovely. is true, I can see the battle of wills theme applying. Finn could be a Shears character - I firmly believe his character development is in finding integrity and he has the courage of Shears. There's also the possibility of a more direct take. First Order decimates the Resistance and takes prisoners. Poe, Finn, Dern, and Tran have to remain resilient as POWs. so a general theme of resilience in the face of despair could be what they go for. It was a great film with a lot to discuss, so... let's discuss away! Crap, that link isn't working and Daily Motion took it down too. Does anyone have a direct link to the movie? Please PM me. - There is quite of bit of tramping about through thick foliage. There are several scenes where people are lost or searching for something, and they have to thread their way through an untamed wilderness. This is the most obvious visual parallel with Letter Never Sent and, hopefully, Episode VIII. - The main plot of the later part of the film involves groups of people, who are ostensibly on the same side, but working at cross purposes in ignorance of the other. I can see this concept being incorporated into a Star Wars film. 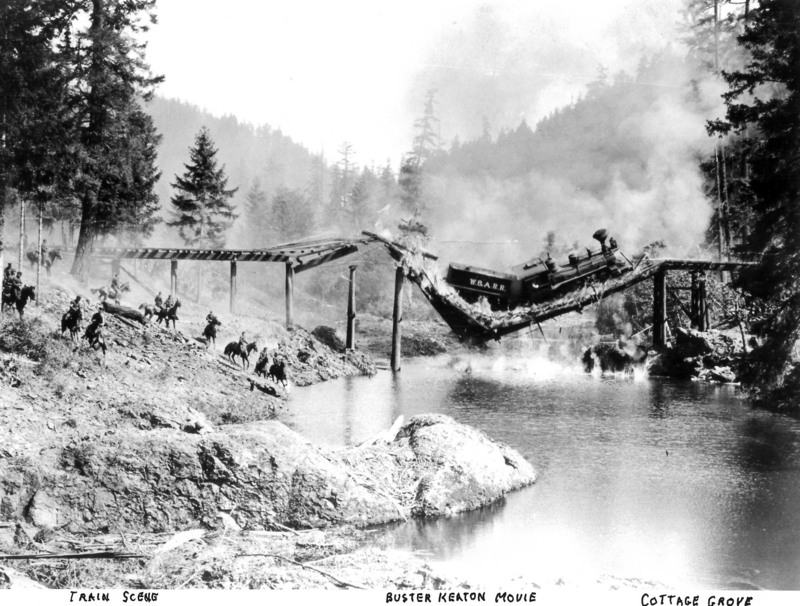 blowing up on the bridge is very similar to the end of the silent Buster Keaton film, The General. - I did not like the soundtrack. It features a lot of pompous and enthusiastic military marches at oddly inappropriate times. Not to mention that annoying whistling tune. - The weird insertion of the female characters. So, it's largely a war film set in a POW camp; not too many women there, sure. But, the film does manage to have a few female characters- one actress actually has lines of dialogue (she's a fling one of the escapees has). The other female characters are silent Asian women who serve to help the men navigate through the island. This features some wordless flirtation between them and the soldiers. The women are supposed to be clever in their own right, but I still found that it's a little awkward to watch with modern eyes. - The plot hinges on the colonialist notion that the British could effectively build a bridge, while the Japanese could not. - The scenes between Colonel Saito (Sessue Hayakawa) and Colonel Nicholson (Alec Guinness). Both of these actors are riveting and watching them work through their power struggles, the confusion of wartime rules, and their defeats is arguably the key to what makes this a great movie. - The claustrophobia of the island. Even though many shots are very wide and you can see long distances, I really got the sense of everyone being trapped there, hemmed in behind dense jungle and the ocean beyond. @MeadowofAshes wrote: Wow. What a film - really glad I made time to watch this one. The cinematography was beautiful, the dialogue was enjoyable on several fronts, and the actors were superb. I bolded your lines that I especially liked. Determination in spite of being surrounded by shambles could be very interesting for episode VIII. Also, I laughed when I heard the "We shall see" line. We'll see has become my favorite line of internal dialogue these days! @LadyHa @MeadowofAshes Late to the party, not much to add to what you two perfectly encapsulated. One question. Could this relate to Ahch-to rather than Resistance plot? Especially with possibility of prisoner Kylo. There's an island, there are people with different sometimes antagonistic POV, there's stubbornness in the wake of threats and torture, tons of pride that leads to wrong actions. Unless they are planning to make Perfect Poe less perfect this could be partial influence for Ahch-to. @vaderito wrote: @LadyHa @MeadowofAshes Late to the party, not much to add to what you two perfectly encapsulated. One question. Could this relate to Ahch-to rather than Resistance plot? Especially with possibility of prisoner Kylo. There's an island, there are people with different sometimes antagonistic POV, there's stubbornness in the wake of threats and torture, tons of pride that leads to wrong actions. Unless they are planning to make Perfect Poe less perfect this could be partial influence for Ahch-to. I hope so! I am very intrigued with the possibilities of the Ahch-to plot. I like to imagine Rian Johnson gathering films that involve people with uneasy alliances vs. a wooded nature where it rains a lot! I love your train of thought. Uneasy alliance is why I'm thinking Ahch-to more than Resistance. I watched about half of the movie last night on youtube and still can't get that whistle out of my head. @MeadowofAshes wrote: This gem of an exchange. "My officers will not do manual labor." "We shall see." I laughed out loud when that exchange happened. It's not even supposed to be funny! So I'm not done yet but a common theme I've noticed between this film and 'Letter Never Sent' is being isolated and trying to survive in a place cut off from civilization, fighting the elements as well as each other, and lots of manual labor. I think it's a given that there's going to be incredible scenery shot especially on Ahch-To since it's based in such a gorgeous location, and that planet is remote above all else - there could be others inhabiting the islands but overall I believe there's going to be a sense of seclusion and a general lack of contact with the rest of the galaxy. It's VHS-quality but the picture/sound all work and it seems to be the entire movie (I'm only about an hour in so far). @WhatGirl Thank you! I'm rewatching (mostly listening and than stealing glances) at work! Any hope we get a video for the next session, 12 O'Clock Noon too? @vaderito wrote: @WhatGirl Thank you! I'm rewatching (mostly listening and than stealing glances) at work! Any hope we get a video for the next session, 12 O'Clock Noon too? I haven't started on that one yet, but when I find a working video I'll be sure to share. Awesome. This was a good movie. I think it's about Resistance.